Teen psychopath Evil Ernie is dead, resigned to Hell where he belongs. 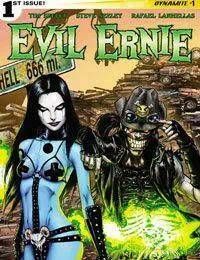 But when reality is threatened by an evil even the Devil cant handle, he calls on the only weapon that can prevent total megadeath: Evil Ernie himself! Mistress Hel has found new love... three of them! And the antihero to end all antiheroes is the world of Chaos only hope.